President Emmerson Mnangagwa will today hold key talks with staunch ally President Vladimir Putin of Russia, with the two leaders expected to centre deliberations on key economic deals, as well as matters of mutual concern on the international arena. Among the major economic issues on the table in Moscow will be President Mnangagwa’s invitation to Russia’s diamond mining major, Alrosa, to enter the Zimbabwe market and help develop the sector. After touring Alrosa’s state-of-the-art facility in the Russian capital yesterday, President Mnangagwa told the media that he would formally present the invitation to Alrosa when he holds talks with President Putin today. 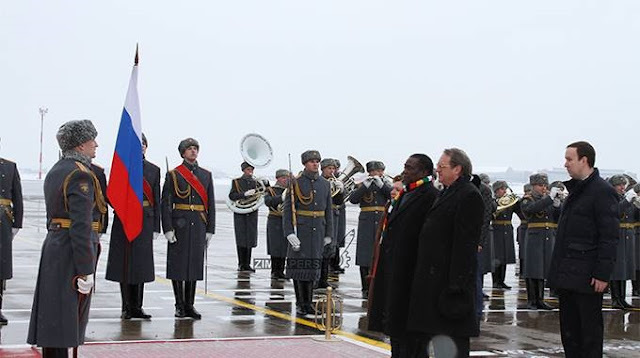 President Mnangagwa is in Russia on the first leg of a four-nation Eurasian tour, after which he will join other influential world leaders and key investors in Davos, Switzerland, for the World Economic Forum. Before heading to Kazakhstan, Azerbaijan and Belarus, President Mnangagwa is in Moscow to concretise arrangements with firms like Alrosa, as he sets about transforming Zimbabwe into an upper middle-income economy by 2030. It is in that context that the talks with President Putin attract much importance. The Head of State and Government and Commander-in-Chief of the Zimbabwe Defence Forces yesterday said, “We believe that Alrosa will accept our invitation as Zimbabwe to participate in the development of our diamond industry. “I’m sure that Alrosa is fully aware that we had closed the diamond industry in Zimbabwe from participation by foreign companies, but this policy we reversed in October last year, just about two months ago. “We now have opened a small window for foreign companies to participate in our industry as a result of realising our limited capacity both in terms of capital outlay, as well as in the application of modern technology to maximise exploitation of our diamonds in Zimbabwe. President Mnangagwa emphasised that Zimbabwe and Russia shared strong ties in the realms of the economy and defence and security co-operation, and engagements between the two sides today and in future would naturally be informed by that rich history. “(Economic co-operation) is the principle reason why I am here with my delegation,” he said. On defence and security co-operation, President Mnangagwa said, “this is not a new area”. “In actual fact, the entire liberation struggle of our country was assisted by your country,” he said. Alrosa’s CEO, Mr Sergey Ivanov, said he had every confidence that not only would Zimbabwe’s economy rebound, but that the Russian diamond mining behemoth would be a part of that growth and development. He said he was not in a position to say exactly how much Alrosa was looking to invest in Zimbabwe, as this would be determined by the outcome of the talks between President Mnangagwa and President Putin, but expressed optimism that the firm would soon have an operation presence in the country. Mr Ivanov pointed out that Alrosa had opened an office in Zimbabwe just six months after its first contact with President Mnangagwa’s Government, and soon that operation would be staffed with the relevant experts to advance the mutual goals of developing the country’s diamond industry. “We will shortly discuss opportunities to explore new fields, promising fields, in Zimbabwe and also how to produce from mature, established fields,” he said. “We are happy to share all expertise in diamond sorting, pre-sales preparations and all other diamonds operations that may apply here. “Let me also add that we were pleased by the top-notch expertise of the representatives of the delegated ministries of Zimbabwe with whom we have worked in the past six months. There is a good pool of experts in mining and exploration in Zimbabwe, so we hope that this, taken together, will underpin better potential for Alrosa to operate in the Zimbabwe market.